NASA will send two astronauts, a veteran undersea engineer and an experienced scientist into the ocean depths off Florida's east coast this month to test exploration concepts and learn more about working in an unforgiving, treacherous environment. 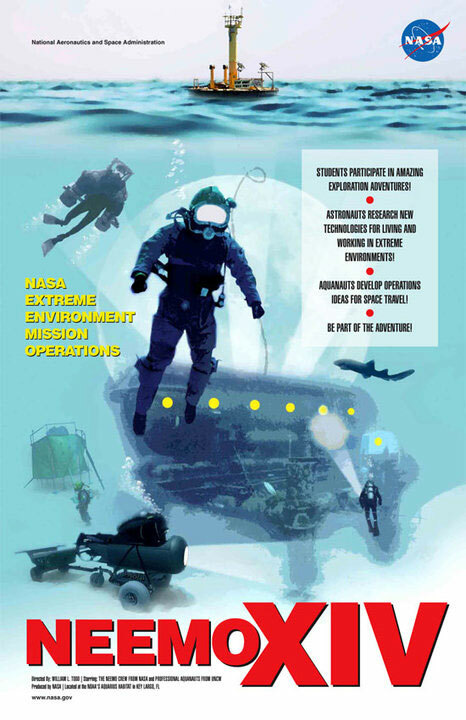 The 14th expedition of NASA Extreme Environment Mission Operations, or NEEMO, begins May 10. Canadian Space Agency astronaut and veteran spacewalker Chris Hadfield will lead the NASA team on a 14-day undersea mission aboard the Aquarius Underwater Laboratory near Key Largo. Aquarius is owned by the National Oceanic and Atmospheric Administration (NOAA) and operated by the University of North Carolina at Wilmington. Joining Hadfield will be NASA astronaut and flight surgeon Thomas Marshburn, Lunar Electric Rover Deputy Project Manager Andrew Abercromby and Steve Chappell, a research scientist. Abercromby and Chappell work for Wyle Integrated Science and Engineering of Houston. To request interviews with the NEEMO 14 crew during the mission, contact NASA's Johnson Space Center newsroom at 281-483-5111, or Carole Duval of the Canadian Space Agency at 450-926-4370, or Fred Gorell of NOAA, at 301-734-1010. During NEEMO 14, the ocean floor will simulate aspects of another planet's surface and a low-gravity environment. In October 2009, a team of aquanauts set the stage for NEEMO 14 by placing mockups near Aquarius of a lander, rover and small crane that simulates a robotic arm. The NEEMO 14 crew will live aboard the underwater laboratory, venture out on simulated spacewalks, operate the crane and maneuver the vehicles much like explorers would in setting up a habitat on another planet. As the aquanauts interact with these developing technologies, they will provide information and feedback to NASA engineers. The crew will simulate removing a mockup of the Lunar Electric Rover from the lander, retrieve small payloads from the lander and the ocean floor, and simulate the transfer of an incapacitated astronaut from the ocean floor to the deck of the craft. The rover and lander mockups are similar in size to vehicles NASA is considering for future planetary exploration. The lander mockup is wider than a school bus is long and almost three times as high. It measures 45 feet wide and 28 feet high, including a 10-foot-high crane. The rover mockup is slightly larger than a full-size SUV, standing eight feet tall and 14 feet long. While inside Aquarius, the crew will perform life science experiments focused on human behavior, performance and physiology. The mission also includes a study of autonomous crew work. There will be periods when there is limited communication between the crew and the mission control center, much like what could happen during missions to the moon or Mars. The six-member crew of NEEMO 14 brings a wide range of experience to the mission. Hadfield conducted two spacewalks and operated the International Space Station's robotic arm, known as Canadarm2, during the space shuttle's STS-100 mission in April 2001. He also worked extensively with the shuttle's robotic Canadarm on STS-74 in 1995. Marshburn, a flight surgeon, conducted three spacewalks on STS-127 in 2009. Abercromby adds his extensive experience in planning and executing field test operations, or analogs, that simulate space environments, such as NEEMO and NASA's Haughton Mars Project, Desert Research and Technology Studies and the Pavilion Lake Research Project. Chappell is an active member of Rocky Mountain Rescue based in Boulder, Colo., and earned a doctorate degree with a focus on human performance in reduced gravity. James Talacek and Nate Bender of the University of North Carolina at Wilmington are habitat technicians and will provide engineering support.